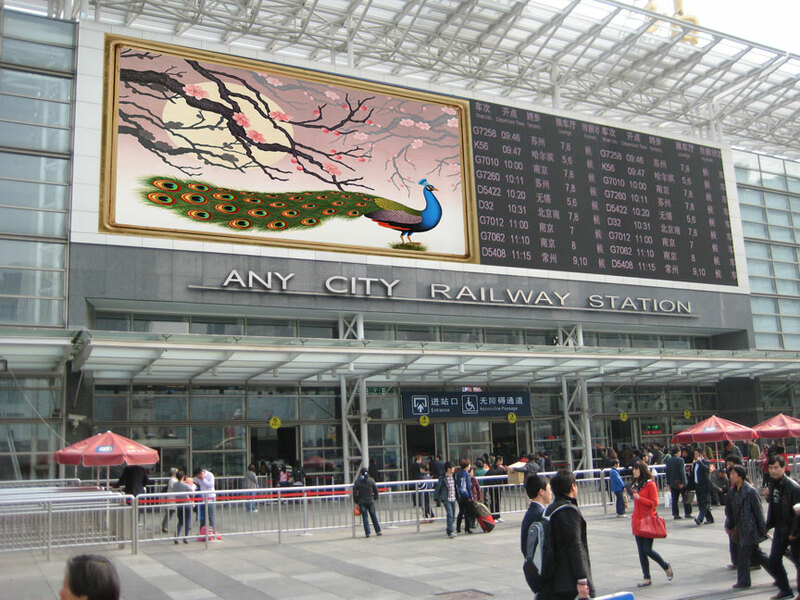 Traditional Chinese wall murals for interior or exterior stations by Visionary Mural Co.
Visionary Mural Co. offers fine art murals digitally painted in any size for interior or exterior installation. Megan McKeithan and her team of fine artists at Visionary Mural Co. design murals and paint them to scale, then digitally paint them at full size in artist’s oil paint on synthetic non-woven substrate. Megan’s team uses Omniscape™, a unique digital painting technology, to create these large-scale murals. Once their highly advanced machines have produced the large-scale murals, fine artists finish-paint them, add a coat of varnish, and they are ready for delivery. No one else has the technology and the experienced team to create beautiful large-scale fine art murals at such affordable pricing. Unlike digitally printed exterior banners and signs, Omniscape™ digitally painted murals are produced in artist’s oil paint, giving them years more longevity than the large format printing you see on billboards or buses. Both the type of paint and the substrate they are painted on enable these murals to stand up to sun light, weather, and pollution much longer than any acrylic or latex paint on the market, adding literally years of life to outdoor murals. The polyester non-woven substrate of the murals adheres to the surface of the wall like a second skin. Unlike murals painted directly on exterior walls, there’s no cracking or peeling, as the paint is infused into the fabric and the fabric is permanently adhered to the wall. The texture of the wall becomes the texture of the mural as nothing comes between the mural and the wall but the glue. After your mural is installed, you can eventually get it down; just be sure to have a sand blaster on hand, or another mural to glue on top, as your mural has nearly become part of the wall. Experienced wallpaper installers are easily trained to install the murals in panels for any size interior or exterior wall. With non-woven synthetic fabric there is no concern for stretching or warping. Proper wall preparation will allow installation on concrete, brick, sheet rock, plaster and any number of wall surfaces. Add two coats of the appropriate varnish for your location after installation and once every five years to expand the mural’s life span indefinitely. Inexpensive drip rails installed along the top of exterior murals will help protect from water seepage and add even more longevity. These are installed with ease on any type of wall surface. 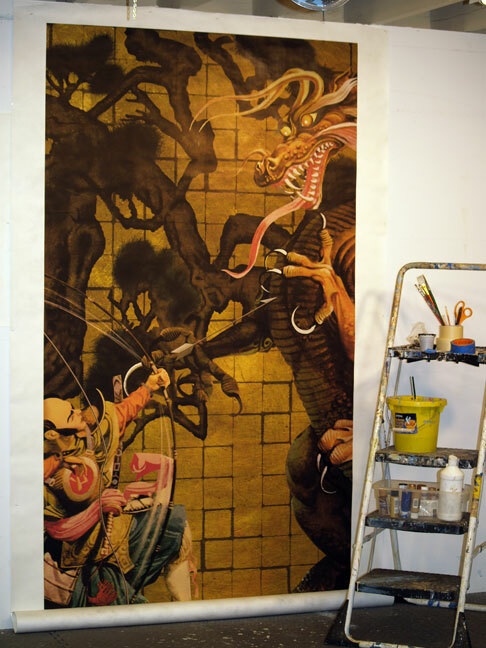 With the unique Omniscape™ digital painting process and fine artist painters, Visionary Mural Co. can produce large orders of murals quickly and economically. 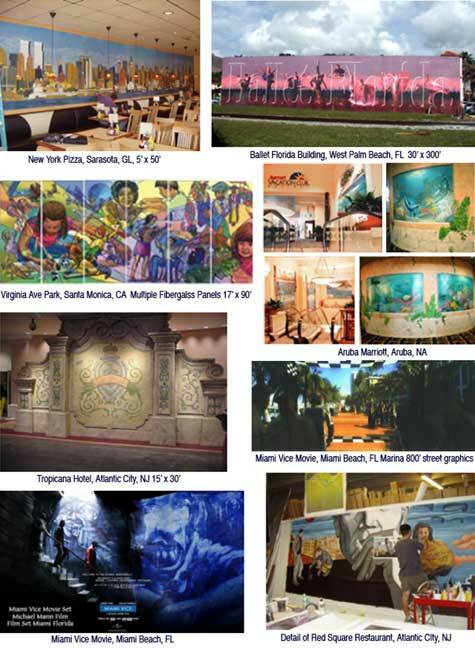 Literally hundreds of thousands of square feet of murals are possible and affordable with this system. If you are planning mural installations across the country, you can save time and money by installing several copies of the same design. All of the copies of that design are painted at the same time. In addition, the same design can be painted at various sizes to accommodate different sites. Remarkably, should any part of a mural become damaged, Visionary Mural Co. can re-paint only that section and deliver it for installation on top of the problem area. The mural material is infused with the paint and adhered to the wall so tightly that an installer can glue the new section up on top of the old section without a problem and the mural is as good as new. The process of creating large-scale fine art murals begins with determining the size of your murals and scope of your project. For example, you will need to know the measurements of the murals you need, the number of murals needed, and how many of the sites are interior verses exterior. You will also need to determine what type of walls you have; murals can be adhered to concrete, brick, sheet rock, plaster and many other surfaces. Any ideas you have for theme or style of the murals are also helpful. Further, you will need to know your schedule for the project so that Visionary Mural Co. can best determine how to plan your designs and project. Once you have all of this information Megan McKeithan can work with you to create your project plan and budget. 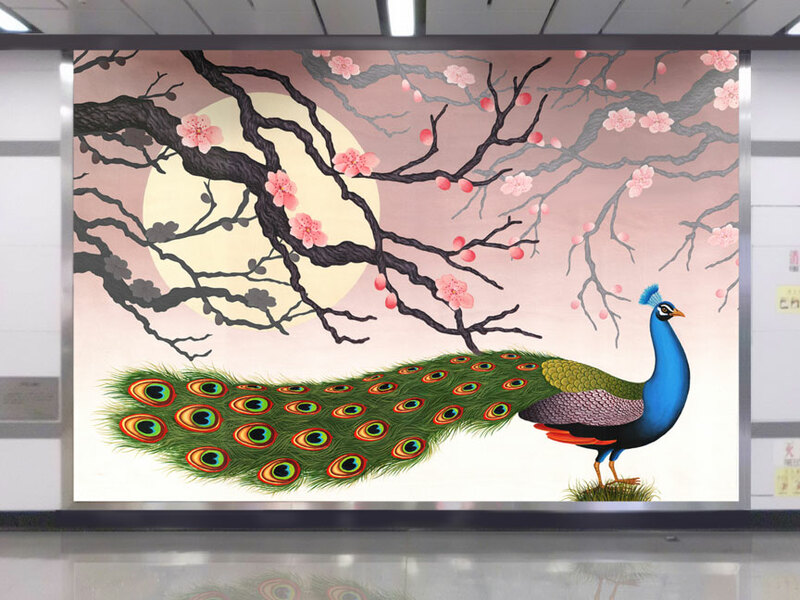 If your project requires a good number of interior murals Visionary Mural Co. may suggest additional production processes to ensure the fastest delivery possible. Your project plan will be designed to meet each of your specific needs. 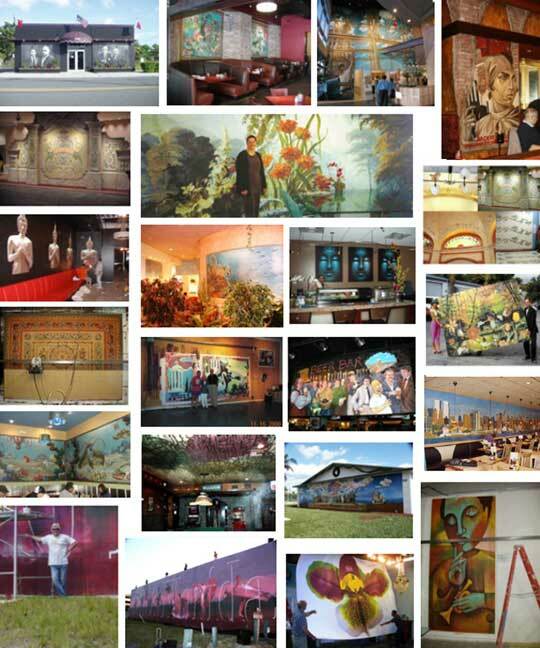 Once you have determined your project plan, Visionary Mural Co. works with you to select the themes of your murals. Together you will decide how many original murals of each theme Visionary Mural Co. will create. 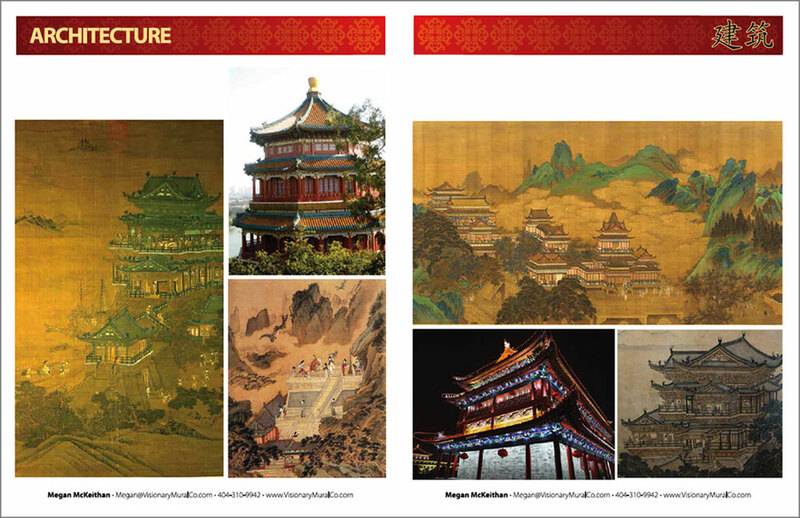 Recently Megan McKeithan and her team of fine artists worked on a series of themes for a company requesting traditional Chinese themes for their murals. 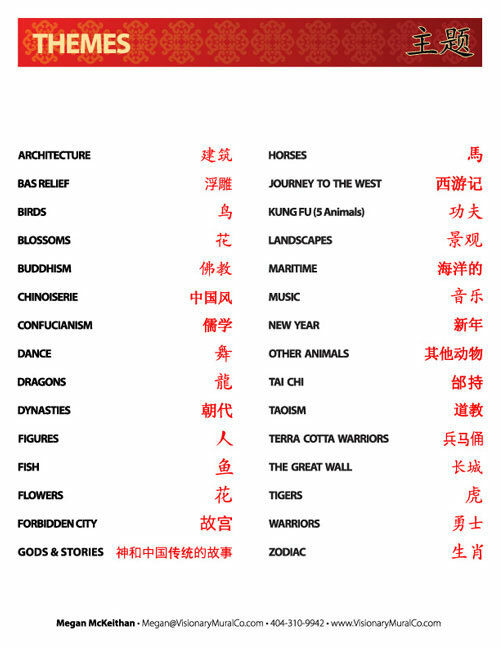 You can see a list of potential themes for this type of mural here. These themes have also been illustrated with photographs showing inspiration for each of the themes in a separate document for the client. 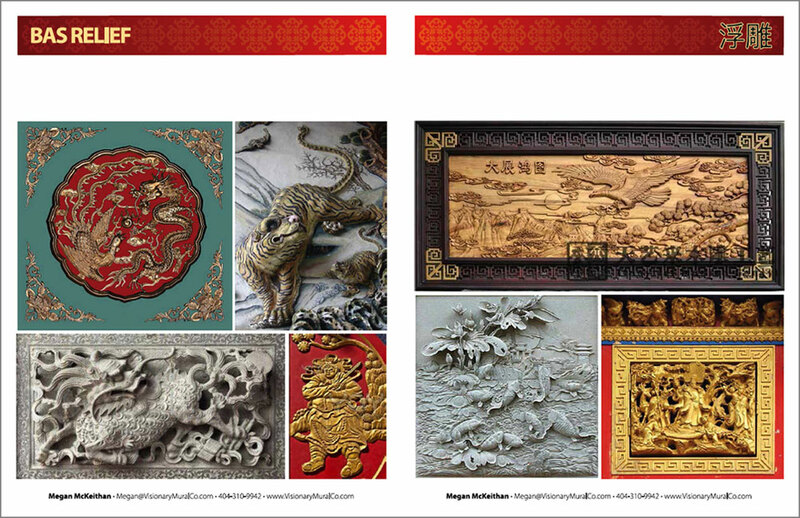 Two pages of this book are included here to give you an idea of the type of book Visionary Mural Co. will create for your project themes. 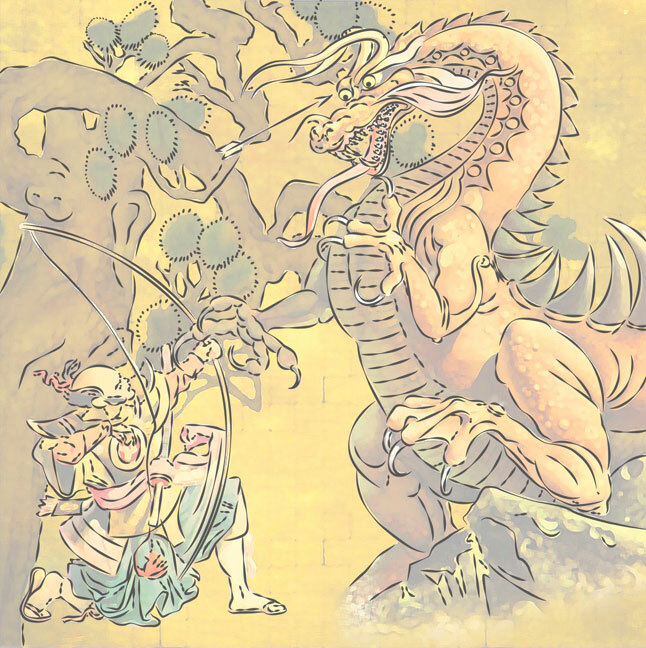 Visionary Mural Co. includes photographs, traditional art works and other illustrations that may serve as inspiration for the themes of the murals. 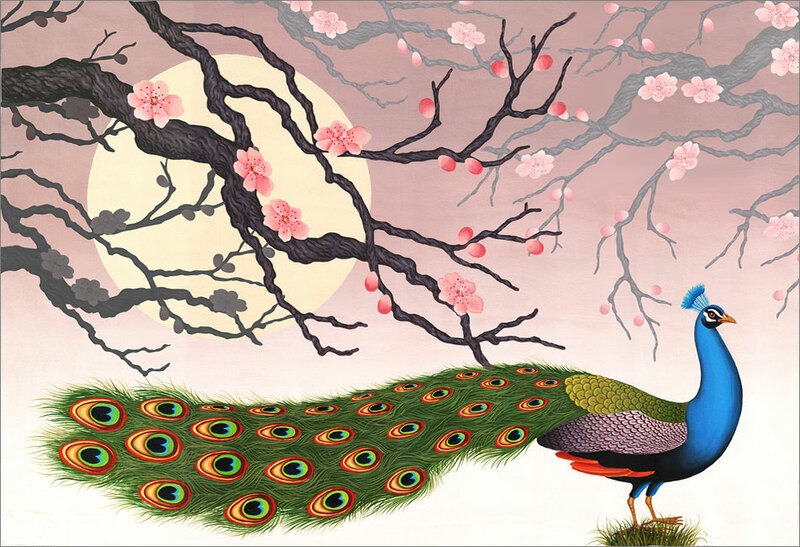 The fine artists at Visionary Mural Co. have created three sample murals in traditional Chinese themes to demonstrate the process of creating large-scale murals. 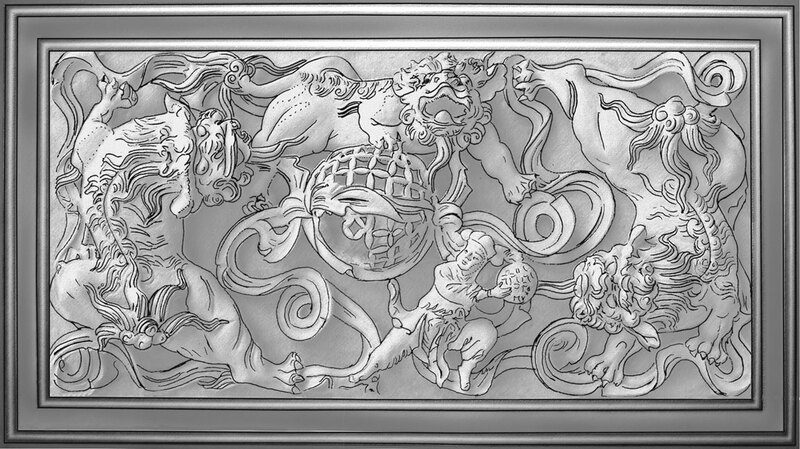 China has a long history of bas-relief sculptural wall murals, so the first sample has been created as a trompe l’oeil painting to look like a stone bas-relief of traditional Chinese Lions. 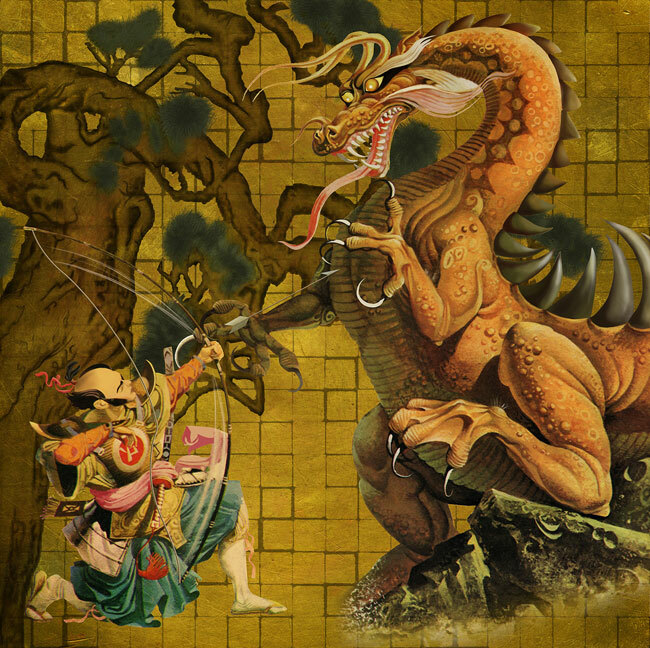 Further, a traditional Chinese folk tale inspired the second sample mural with warrior and dragon, complete with a traditional gold leaf effect. 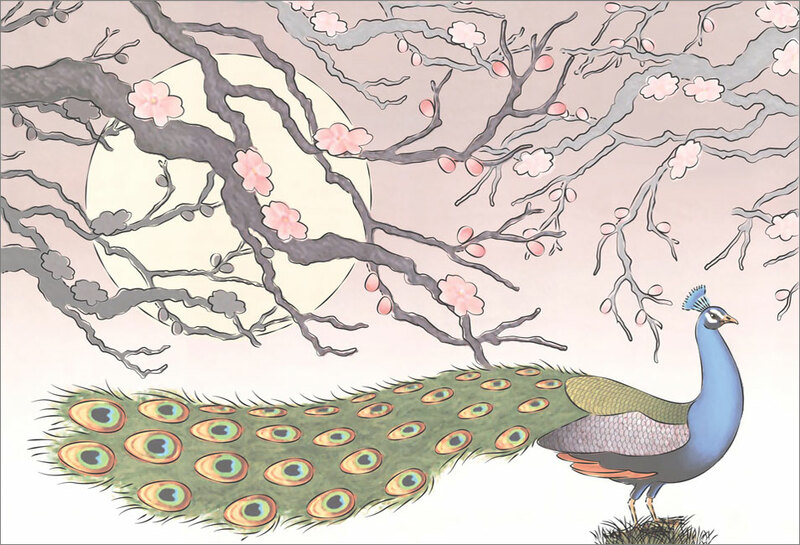 The third sample includes a peacock, an image of dignity and beauty found throughout Chinese art history. 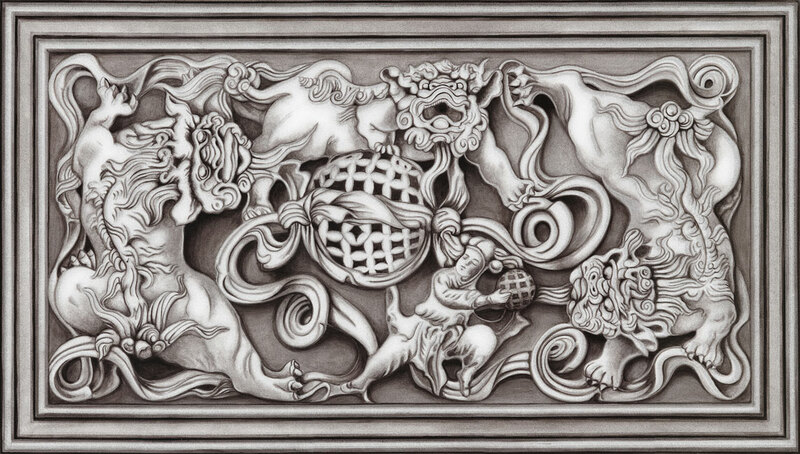 Once you have agreed to themes for your murals, Visionary Mural Co. creates drawings known as Sketches of the murals. All Sketches are created within the themes you have already agreed upon and are intended to show the subject matter and general color and style planned for each mural painting. Visionary Mural Co. then submits the Sketches for your approval via Internet in a sophisticated on-line project management system. This interactive system will allow you to view each phase of your project from beginning to end. You can review images, ask questions, comment, and submit approvals all in one place, making the process run efficiently and transparently for all parties. Once you have approved the Sketches, the fine artists will paint the Original Mural Paintings at a scale of approximately 1:5. 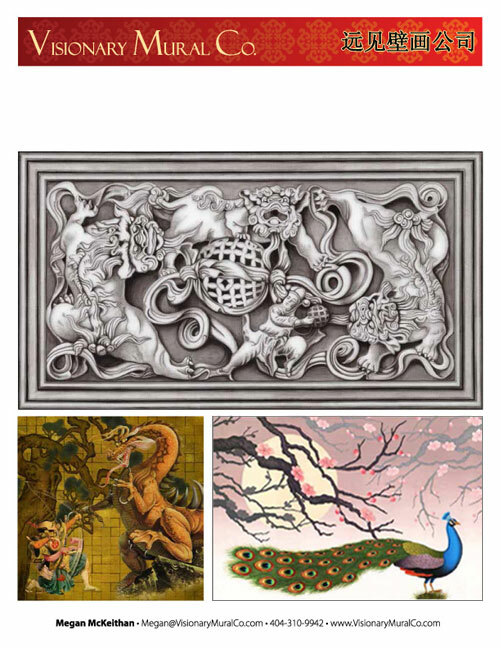 These paintings are highly detailed and suitable for enlargement to the final mural size. The finished Original Mural Paintings will be scanned and submitted to you for approval. You will be able to track the progress of each part of the project from Sketch to Original Mural Painting to Finished Large-scale Mural. 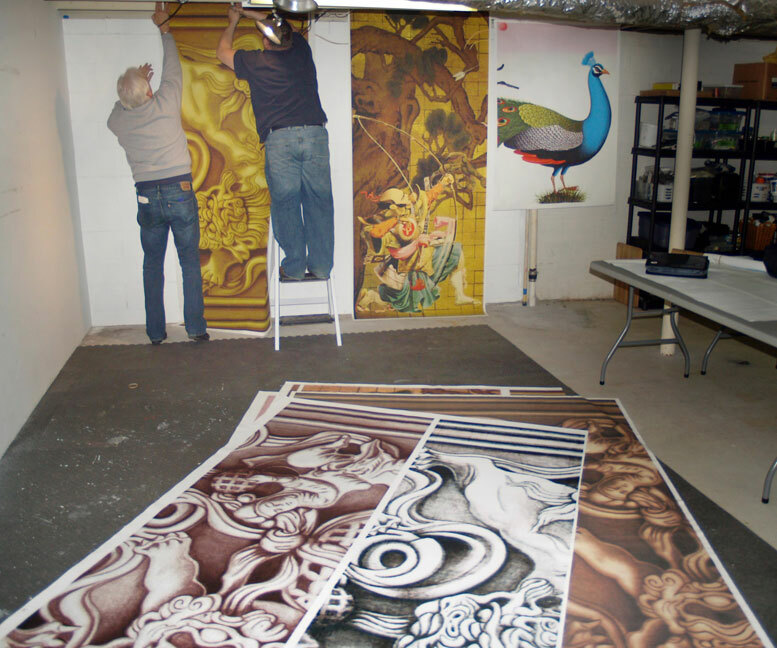 Once the Original Mural Paintings are approved, Visionary Mural Co. creates full sized paintings of the murals, known as the Finished Large-scale Murals. 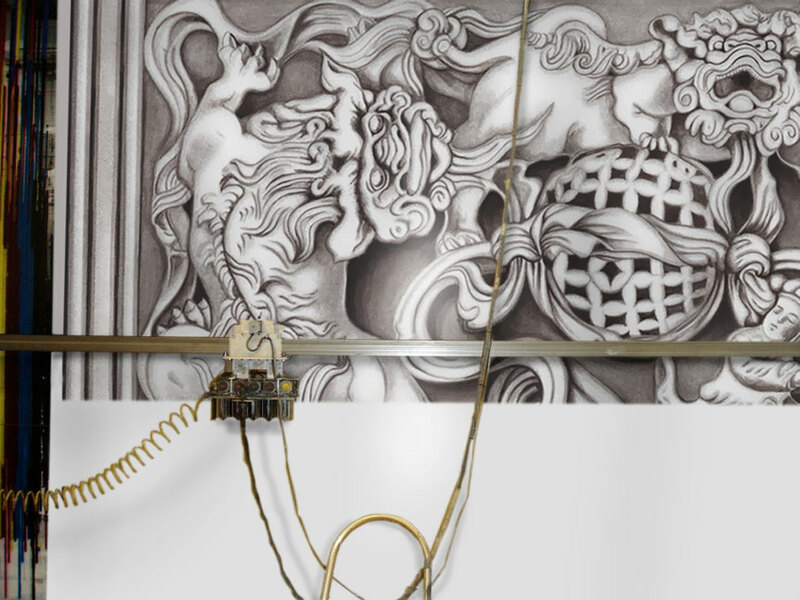 Using their unique Omniscape™ technology, Visionary Mural Co. artists first digitally paint the murals with advanced technology machines, then finish-paint them by hand and coat them in protective varnish. 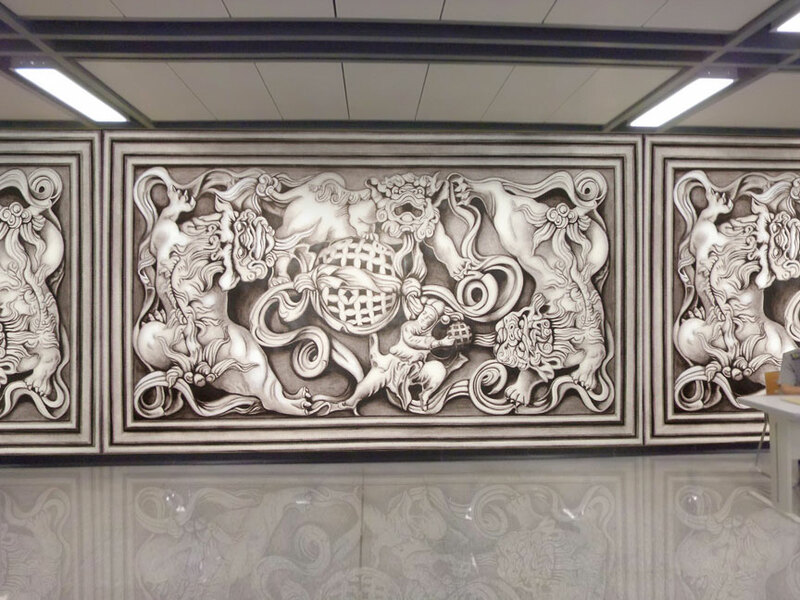 The Finished Large-scale Murals are painted on overlapping panels so that they are easily installed like wallpaper. Visionary Mural Co. determines the best width of each panel based on the measurements of the site. Most often the panels are painted to ensure ease of installation; the width of the panel can usually be held and glued in place by one or two people. Visionary Mural Co. will show your installers the process at the beginning of the project then supply you with training videos and written instructions, and offer on-line and telephone customer service throughout your project so you can be sure the murals will be installed correctly. Smaller scale original murals are digitally painted at full scale using unique Omniscape™ technology on user-friendly lightweight panels then finish-painted, varnished, and prepared for shipment. 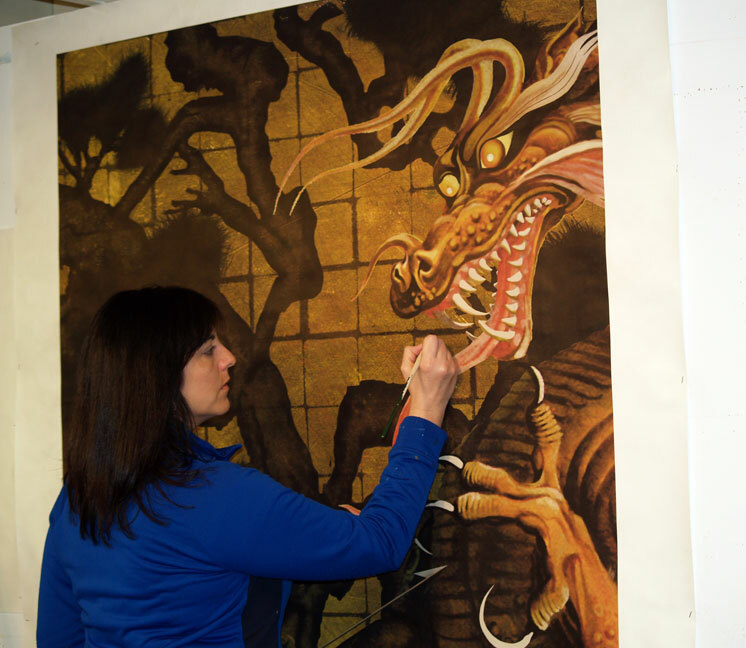 Once your Finished Large-scale Murals are complete they are approved by your representative at our factory and then turned over to you for shipping. The finished large-scale murals are very lightweight. 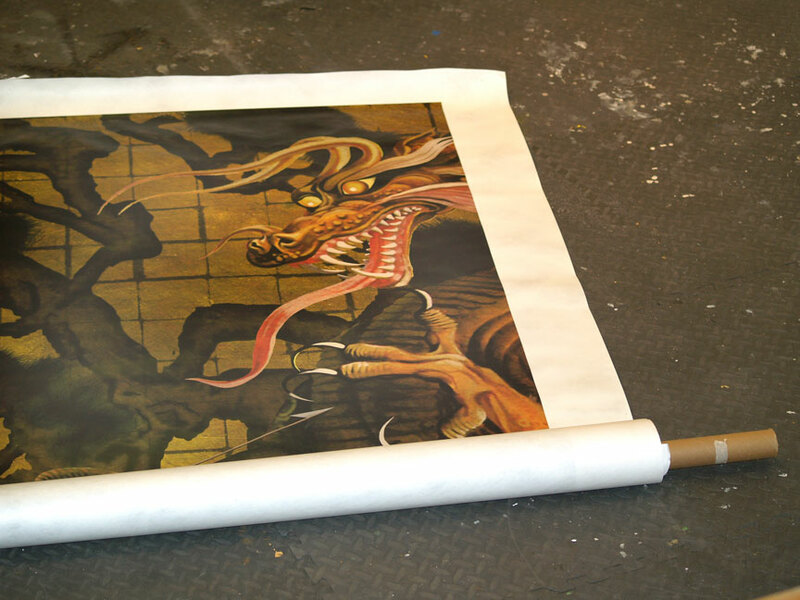 Many murals are layered on top of each other and rolled together onto tubes for shipment. It is often most efficient to ship them via air freight versus shipping container, as literally thousands of square feet can fit in a space much smaller than a shipping container. There is no need to wait to fill an entire container; the murals are produced quickly enough to allow you to begin installing projects as soon as Visionary Mural Co. can produce them. In addition, the cost of shipment by air is quite reasonable for the scale of large projects. Visionary Mural Co. will work with you to determine the best system for you to transport the murals from our factory to your installation sites. 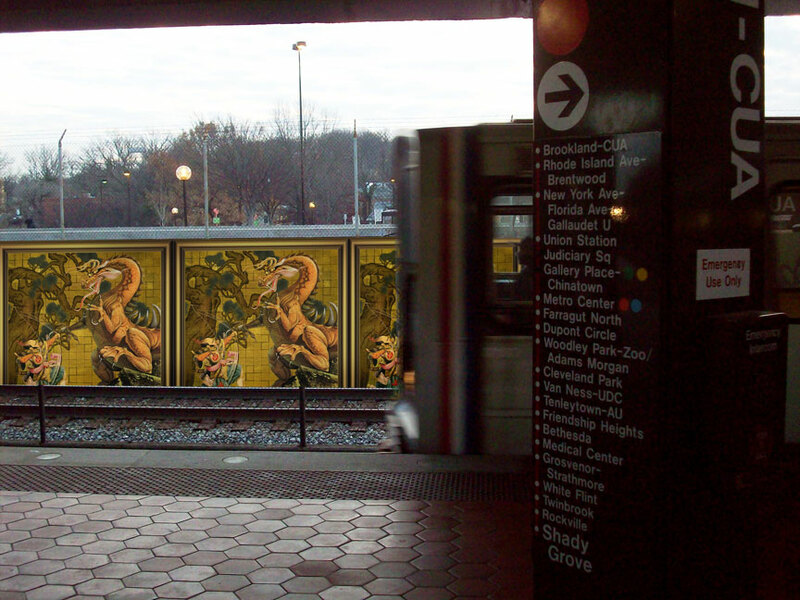 Included here are renderings of potential interior and exterior installations of the sample murals. 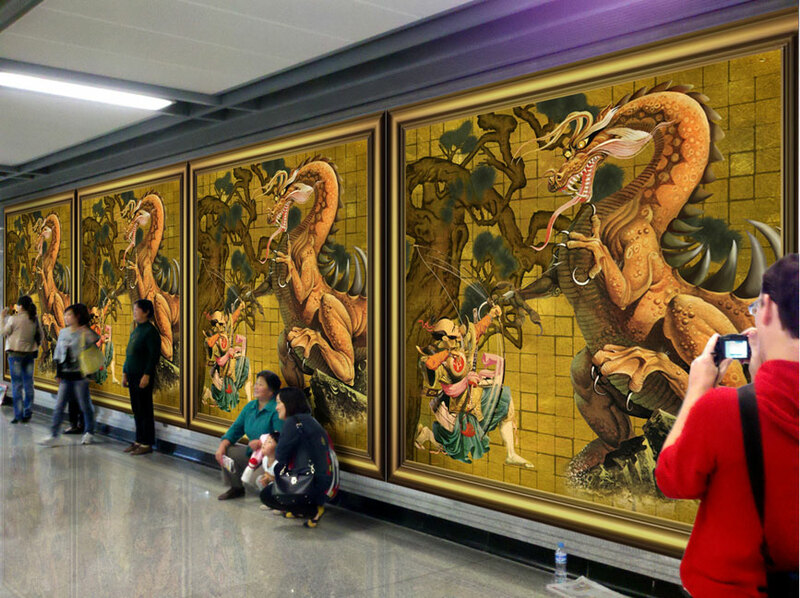 These images are Chinese Railway Stations and other subway, railroad and rail transit areas intended to demonstrate potential locations for the murals. Please note that the sample Original Mural Paintings have been repeated in some of the rendered images only to fill the appropriate areas. 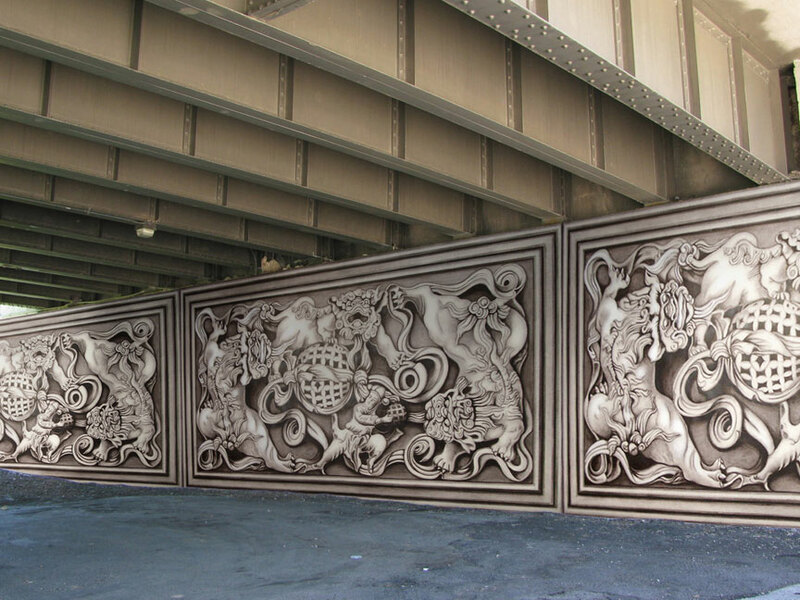 Finished Large-scale Murals will be designed to fit your actual site measurements. 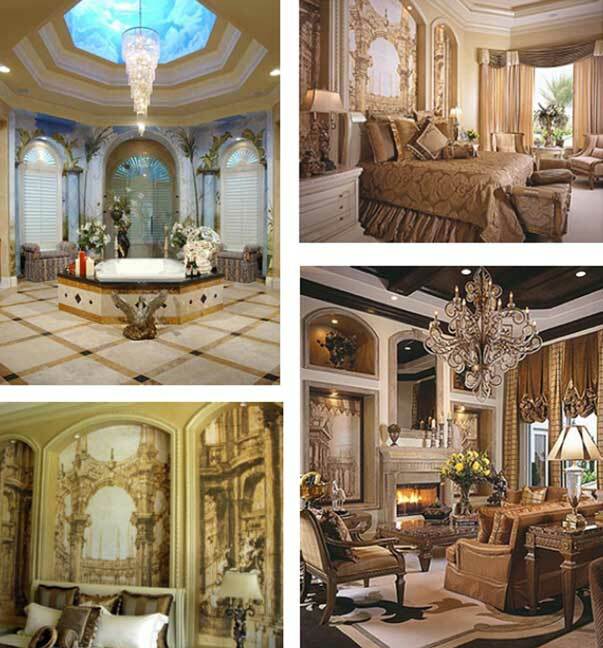 The experienced team members of Visionary Mural Co. have created hundreds of thousands of square feet of murals using their unique Omniscape™ technology combined with fine artists’ original paintings and finish-painting. Please contact Megan McKeithan at Visionary Mural Co. to find out more about creating large-scale murals for installation anywhere. She will be happy to discuss your project scope with you and offer quotes on large-scale mural installations. No one else has the technology and the team to create beautiful large-scale fine art murals for interior and exterior sites at such affordable pricing. 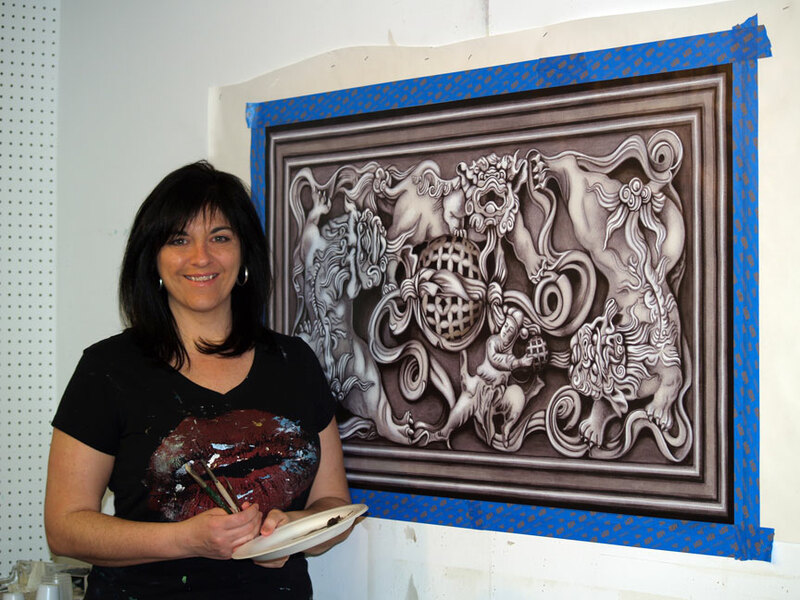 Visit www.VisionaryMuralCo.com to see other fine art murals, trompe l’oeil illusions and complete environments by Visionary Mural Co.